I took a short break from writing this blog because after back to back summers of trying to keep up in the rat race, I wanted to stop. Ever since I moved here from India, I’ve had an endless to-do list of things I needed to accomplish so I could set the ball rolling on somewhat fitting in. Some of the tasks included making my house a refuge, another was turning my gardening hobby into something more than just a fling. Then there was the task of getting a driver’s license and cooking to teach myself what I really like to eat on a daily basis and making notes for a book I might want to write. To people who do jobs and keep pursuing creative hobbies on the side, you don’t owe anyone an explanation as to why you break. Breaks are necessary and allow you to come back energised, with more ideas and the ability to learn more about yourself and how you tick. Everybody needs one from time to time and since this blog is not my job, it felt easier to step back. I wrote here last on August 31 and while I’m wondering just-like-you where is the time going, I’m ready for November. Ready because every year I have a goal to volunteer at a place that provides meals for people in need or spreads the message of food justice, and every year I don’t. The Holiday season can be difficult for a lot people different reasons but a major one that sticks out is financial. Advertisers will spend a lot of money through various channels encouraging mindless consumerism during these last 3 months of the year and then stop until “back to school” starts in June/July. This not only puts a lot of pressure on middle-class families but it also reveals a stark disparity not-so-deep beneath the surface in the communities we live in. Standing back from this blog gave me the chance to think about putting small ideas I’ve been sitting on into action to work on creating more opportunities for others to do better. So in the next few weeks, I hope to call some numbers, start volunteering and meet new people in the process. I might not blog as much but I think it’s a small price to pay. There are other gems in his essay and if you’d like to familiarise yourself with his work, it’s all here. Author Mikki Halpin writes about “practical activism” in her essay adapted from her Tiny Letter www.tinyletter/actionnow. She gives great ideas on how you can be smart about how your spend your time actively participating with organisations or on issues you care about (rather than feeling compelled to help EVERYBODY). There are more essays like these and you’ll end them all feeling inspired to take your love of food outside the kitchen and onto bigger places. More than that, Feed the Resistance is also a recipe book, standing on the shoulders of past movements where food and resistance were often interconnected, one unable to exist without the other. Turshen created recipes for this book along with contributions from a community of chefs, writers and activists who spend their time working as in food and activism all across the US. It’s divided into three categories: Easy meals for folks who are too busy resisting to cook, Feeding the masses: Food for crowds and Baked goods + Portable snacks. There are also lists on easy and not-so-obvious ways to reach out to people in your community and engage with them. All proceeds from the sale of this book will go to the ACLU, an organisation that works to protect the civil liberties of all people in the US, which make it the most perfect gift to give all your civic-minded friends. If you’re thinking about buying it, I promise that you’ll get so much back in return. Which brings me to part 3 (is it part 3? ): A giveaway at the end of the month (of this book! Because I want to.) and an opportunity to support organisations in Washington working for food justice with every blog post I write in November. My pick of the month is Feest, a youth-led non-profit working on out-of-school programs in the communities of White Center and Delridge in Seattle. They come together to lead, plan and prepare all the meals for group and community dinners and the goal is to teach them leadership skills, healthy eating habits, food justice and racial equity. Tomorrow (November 3) is their annual cocktail party where they will raise funds and announce what will be new in the coming school/work year. If you feel like you are able, please donate to Feest by clicking this link. If you want to do more than just donate money, subscribe to their newsletter to stay updated on what they’re doing so you can jump in when you’re able. If it’s something you’ll enjoy (who wouldn’t enjoy cooking in a group of awesome teenagers and then sitting down to eat?! ), volunteer. 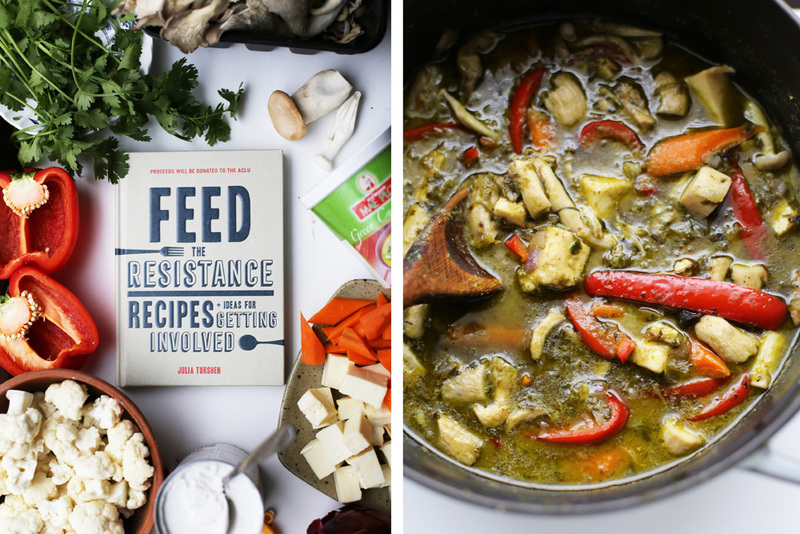 To further entice you, here’s an inspired recipe from Feed the Resistance by Julia Turshen. I hope you make it, share it and learn from it. 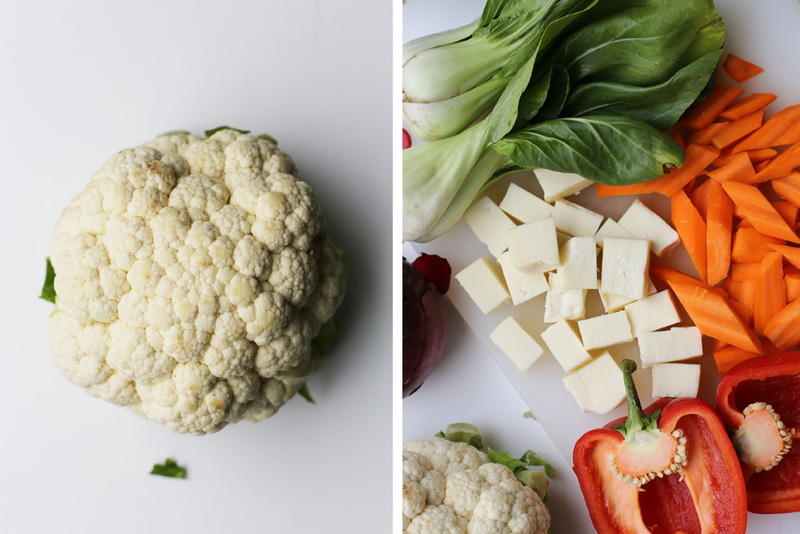 In the headnote to this recipe, Julia writes that this recipe is the “answer to all the random vegetables kicking around your refrigerator and counter”. Add the vegetables to the pot in the order of which they will cook. Hardier vegetables first and leafy ones last. 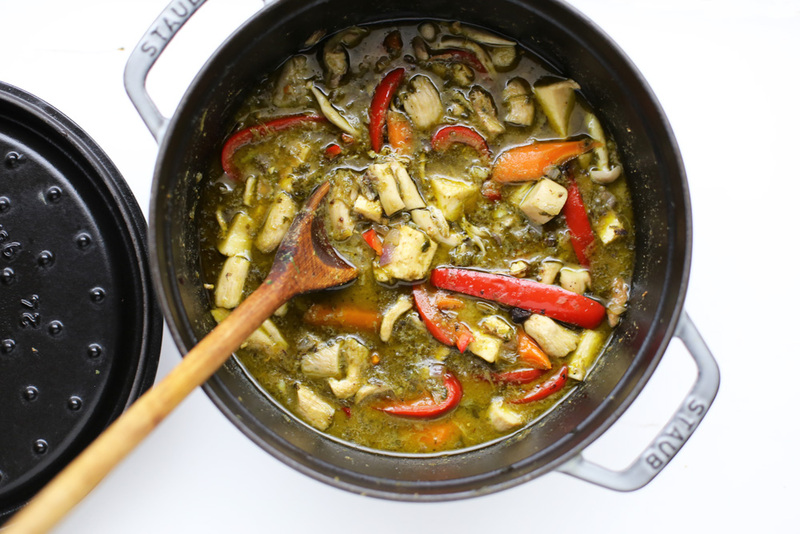 I used store-bought green curry paste (Mae Ploy brand) but any green curry paste will work here. The green curry was a little spicier than I had anticipated so if you like, use a little less paste than what’s mentioned here. 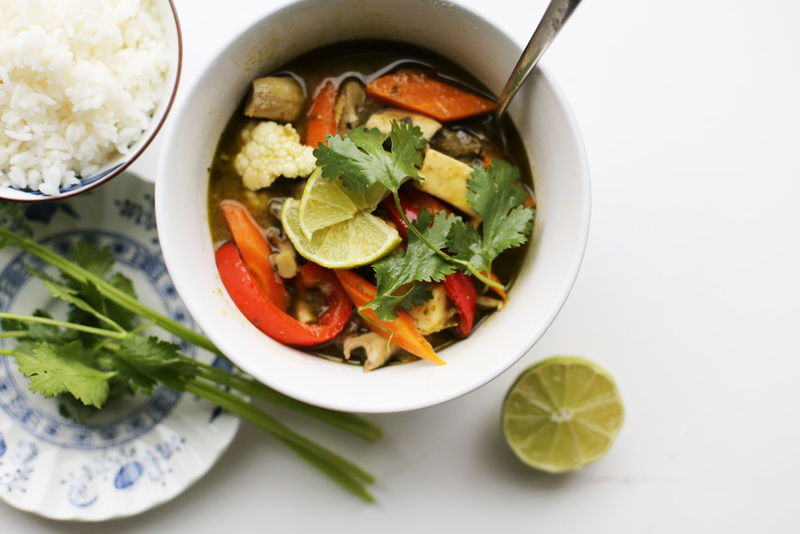 If you follow a vegan diet, be sure to check the ingredients of the curry past as some of them will contain shrimp or fish sauce. Place the olive oil in a large pot set over medium-high heat. Add the shallots, ginger and garlic and cook, stirring now and then, until barely softened, about 2 minutes. Add the curry paste and stir well to lightly fry the paste and just wake it up (you will smell it), about 30 seconds. Add the coconut milk and whisk well to dissolve the curry paste. Add about a cup of water and increase the heat to high to let it all come to a boil. Once it boils, decrease the heat to a simmer. Stir in the cilantro and the tamarind paste and then season the curry to taste with salt (the amount will depend on your curry paste). Stir in any hard vegetables that will take a while to cook (hardy vegetables like chopped carrots, cauliflower, cabbage and/or potatoes), cover the pot and let them simmer until they’re tender, about 10 minutes. Stir in any vegetables that just take a little time to get tender (mushrooms, sliced peppers, green beans etc) and let them cook, until tender, about 5 minutes. Lastly stir in any vegetables that just need to be kissed by the heat (frozen peas, snow peas or leafy greens) and cook them until they are tender/wilted, about 2 minutes. Give everything a nice stir, taste and season with more salt, if needed. Previous Post: « Melon-choly + 3 recipes!